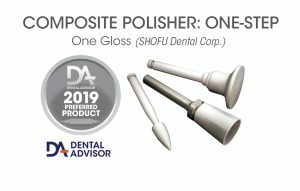 Page view compliments of SHOFU DENTAL CORP.
OneGloss PS are disposable, one-step aluminum oxide finishers and polishers for use on composite restorations and temporary crowns and for removal of excess cement and stains from enamel. OneGloss PS (Plastic Shank) is designed for slow-speed, latch-head handpieces at 3,000-10,000 rpm. OneGloss PS is available in three different shapes (cups, cones, midi points). The aluminum oxide finishers and polishers are mounted on sturdy plastic mandrels and are individually wrapped. The OneGloss PS Assortment Kit contains 15 cups, 15 inverted cones, 20 midi points, product literature, and manufacturer’s instructions. OneGloss PS was evaluated by 15 consultants in 362 uses. This product received a 91% clinical rating. Nearly all of the consultants liked the selection of shapes and the durability of the finishers and polishers. The polishers are individually packaged in clear cellophane that is easy to open at the time of use and keeps them clean during storage. OneGloss PS produces a smooth finish and a light polish to composite surfaces. For a high luster, other products may be used after OneGloss PS. Fifty-three percent of consultants reported that OneGloss PS finishers and polishers were better than their current composite finishers and polishers and 13% reported that they were equivalent. Fifty-three percent would switch to OneGloss PS finishers and polishers and 73% would recommend them. Use higher pressure for finishing and lighter pressure for polishing. Use with water spray with latch-type slow-speed handpiece. Do not exceed 15,000 rpm.